Download these gender reveal scratch-off tickets and use them to creatively tell your friends and family whether you’re team pink or blue! It’s crazy to think that over a year ago I was pregnant with my little boy. How in the world do I have a one year old you guys?! I’m in serious denial over here. I am growing a bit nostalgic and missing the baby stage like crazy, so I decided to go with it and make a fun Silhouette file to share with y’all today! The one thing I didn’t do when pregnant was do a huge gender reveal with family and friends. I actually really wanted to, but then when we found out about my son’s condition Chris and I decided that something low-key felt more comfortable. When we originally talked about doing a reveal I really wanted to make gender reveal scratch-off’s as a way to tell everyone. I had looked up the how-to and was all excited to get them done, but we ended up not doing the party so I wasn’t able to make the craft. With Bridget Jones Baby coming out today (who else is excited?!) a couple blogger friends and I decided to do some baby crafts for the movie release. 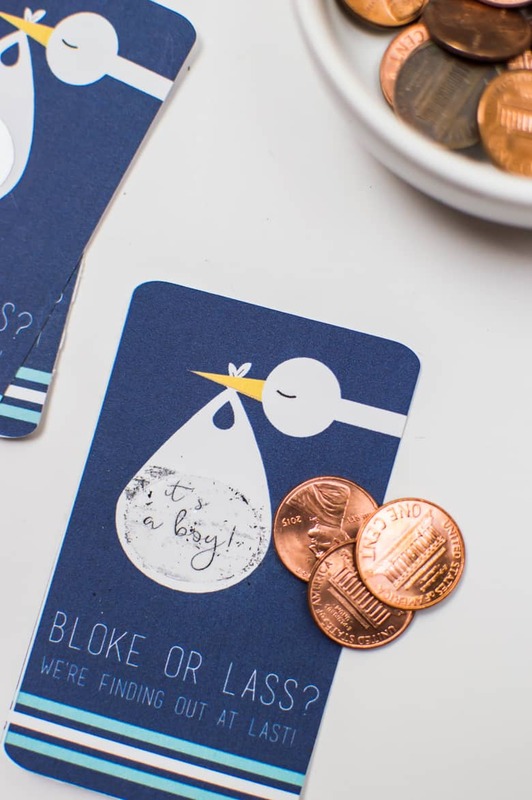 Keep scrolling for their projects, but for now find out how I made these fun gender reveal scratch-off’s! If you don’t have a Silhouette to cut the reveal cards out, download the PDF file here! Download the gender reveal scratch-off’s! 1. Once you download the files, open them up in the Silhouette studio and add registration marks (if they aren’t already there). 2. Print the page out on your printer then put it on your Silhouette cutting mat and load it into your machine. 3. Select cardstock and send to the Silhouette, and watch it cut everything out! 4. 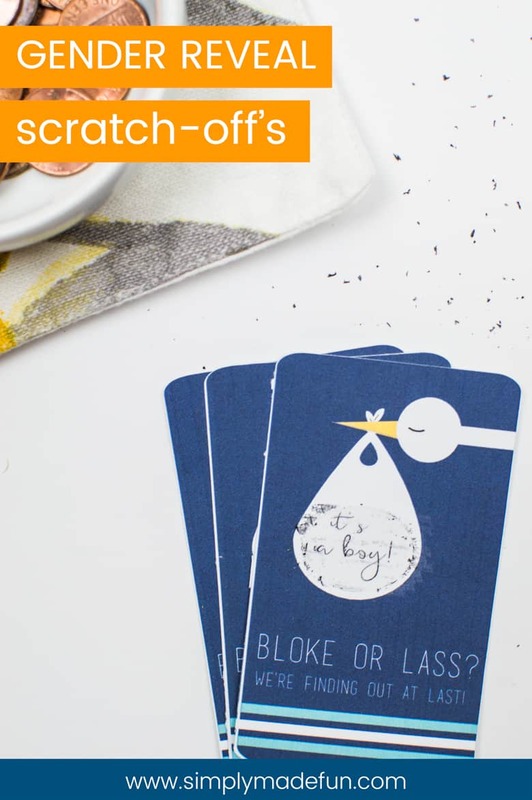 Once the gender reveal cards are cut, load the scratch-off paper onto your cutting mat and load it into your Silhouette. Open up the circle file (here), select scratch off paper, and send to the Silhouette. 5. When everything is cut out, layer the scratch off paper on top of your gender reveal cards, and that’s it! When you scratch off the paper with a penny, there is a clear “sticker” that is left behind so that you can read what is underneath. I’m so excited about this scratch-off paper, it’s so fun to use! I really wanted to use a play on the words “boy or girl” so I used “bloke or lass”. Honestly, I know lass is Scottish but there isn’t a good British word for girl (other than girl) so I went with the next best term. And, because we’re all about tying this project in with Bridget Jones it had to have some nod to our friends across the pond! And just for full disclosure, I honestly only saw Bridget Jones Diary last week. What the heck was I thinking?! Such a cute and funny movie. I’m now completely obsessed. 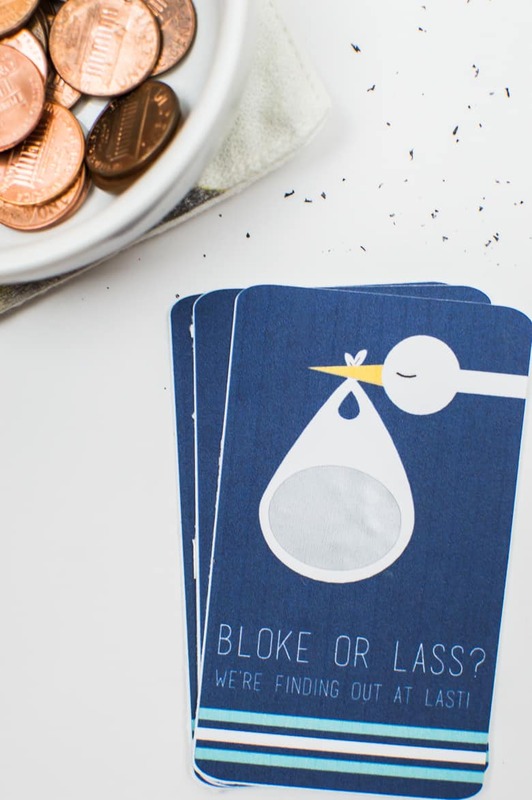 Download the gender reveal scratch-off’s before you go! Did you tell your family and friends what gender your baby was in a fun way? And are you going to go see Bridget Jones Baby now that it’s in theaters? Check out these other fun baby projects inspired by the new movie! Want more baby projects? Check these out! This makes me wish I had done some stuff like this for my baby shower. If only! I’m sure everyone on Pinterest is eating this stuff up! Great how to post!